on Wednesday, 22nd May 1929. Steam Railmotor No. 93 was built in 1908 to Diagram R, Lot 1142. Diagrams O and R represent a group of thirty five virtually identical railmotors ordered by the Great Western Railway in four batches between September 1905 and February 1908. 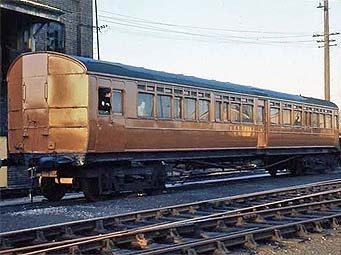 These railmotors were, as the most numerous design of railmotor, the standard branch line type in use on the railway. 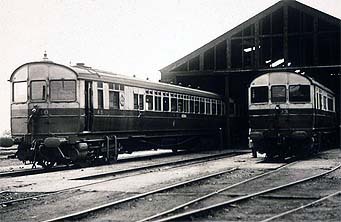 One of the batches, consisting of 12 railmotors, was constructed by Kerr, Stuart of Stoke on Trent, with the body manufacture sub-contracted to Hurst Nelson of Motherwell. The other three batches, including the ten vehicles of Lot 1142, with No. 93 amongst them, were manufactured at the Great Western's own works at Swindon. No. 93 was initially allocated to Southall shed and from then on spent time at many other depots including Bristol, Croes Newydd, Chalford, Gloucester, Stourbridge, Taunton and Yatton. No. 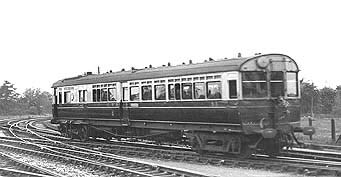 93 was condemned as a Steam railmotor at Swindon on 19th November 1934 and was converted into Auto Trailer No. 212 in which guise it appeared in May 1935 to Diagram A30, Lot 1542. Mobile work study office number 079014 sits on the ash siding at Didcot not long after arrival on site. The Auto Trailer was itself condemned in May 1956. However, the vehicle was not scrapped but converted into a 'Work Study Coach' with a British Railways internal user number of 079014, this ended up in use as an office in Birmingham. When British Railways wished to dispose of the vehicle, it was acquired by the Great Western Society and brought to Didcot Railway Centre in 1970, becoming the sole example of the Great Western Railway's original fleet of 99 steam propelled railcars to enter preservation. 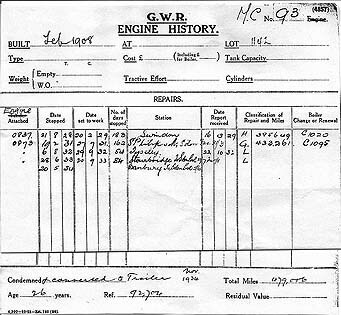 An extract from the original GWR engine history sheet for number 93 showing the last few years in service before conversion to a trailer. Listed below are allocation and overhaul dates taken from the records held by the National Archives at Kew. The original data can be viewed at the National Archives in the following files: RAIL 254/61 – 93, 210, 224 – 331.